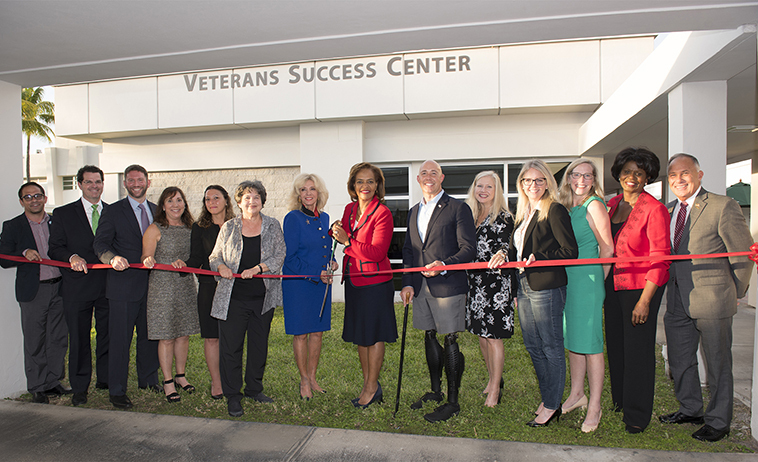 Palm Beach State College held a grand opening ceremony Thursday for the new Veterans Success Center on the Lake Worth campus. About 175 people attended the event, including student veterans, elected officials and business and community leaders. U.S. Reps. Lois Frankel and Brian Mast were the guest speakers. The 2,300-square-foot facility is designed to support veterans and their families who are pursuing their education at PBSC. It features a lounge for social and recreational activities, study areas, a computer lab, tutoring, mentoring, academic and career advising, and other services. It replaces a one-stop center that the College established in an office on the campus in 2009. However, to create more space and offer comprehensive services for veterans and their families, PBSC renovated a Criminal Justice building to establish the new freestanding Veterans Success Center. The center was made possible because of an $800,000 one-time appropriation approved by the Florida Legislature in 2016 and backed by former state Sen. Maria Sachs, who served as chair of the event. Former State Sen. Maria Sachs addresses the audience. Click the image to see the photo album. 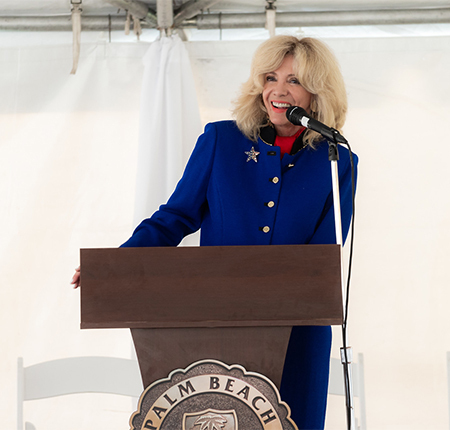 PBSC President Ava L. Parker recognized Sachs for her support, along with the 2016 members of the Palm Beach County legislative delegation. Sachs, a champion of veterans and whose late father served in World War II and Vietnam, thanked Parker, whose father also served in the military, for her leadership in seeing the facility come to fruition. She said there are 15,000 veterans living within proximity of the Veterans Success Center. “Without her guidance, her motivation and her stubbornness…this never would have happened,’’ Sachs said of Parker, noting that it’s not easy getting money from the Legislature. Ribbon-cutting ceremony at PBSC’s new Veterans Success Center on the Lake Worth campus (from left): Daniel Sohn, council member, Town of Haverhill; Todd J. Bonlarron, assistant county administrator; state Rep. David Silvers; state Sen. Lori Berman; state Rep. Emily Slosberg; U.S. Rep. Lois Frankel; former state Sen. Maria Sachs; PBSC President Ava L. Parker; U.S. Rep. Brian Mast; Mayor Anne Gerwig, Wellington; Palm Beach County Mayor Melissa McKinlay; Darcy J. Davis, PBSC District Board of Trustees member; Carolyn L. Williams, PBSC DBOT chairperson; David Rutherford, vice president, PBSC Institutional Advancement, and executive director of the PBSC Foundation. Frankel, whose son is a Marine Corps veteran who served in Afghanistan and Iraq, said she has a bill pending in Congress to reauthorize a grant program for colleges and universities to establish similar centers. She hopes to get it passed. “The physical and the emotional transition coming from the military can be very rough. So many of our men and women slip through the cracks when they come home. That’s why what we’re doing here today is just such a blessing for our community,’’ she said. “I think that everybody who’s a part of this school knows that, and that’s why they worked so hard to make sure they have a Veterans Success Center,’’ he said, noting the sacrifices veterans make serving the country― sacrifices that he understands. While deployed in Afghanistan, he worked as a bomb disposal expert under the elite Joint Special Operations Command. The last improvised explosive device that he found resulted in catastrophic injuries, which included the loss of both of his legs. PBSC serves more than 1,100 veterans and their families. The College also has facilities for veterans on its Palm Beach Gardens and Boca Raton campuses. Visit www.palmbeachstate.edu/VeteransServices for more information. View the photo album for the grand opening.